What Could You Do with Google Classroom? Teachers love Google. So you likely shouldn’t be surprised that everyone has been talking about Google Classroom on Twitter recently. I watch social media closely and it’s my job to share some of the hot topics on Twitter, Facebook, Pinterest, and other outlets that teachers, principals, students, and parents are contributing. Google Classroom, described on the Google website as “designed hand-in-hand with teachers to help them save time, keep classes organized, and improve communication with students.” You receive access by signing in with your school Google account. Google Classroom is a one-stop Google shop for teachers, including lists of helpful products, training, and resources for students and teachers. In fact, some of the world’s best Google training for teachers comes from SimpleK12, and you can check out upcoming Google Classroom webinars here, many free. Why teachers use it is obvious. How is a little less so. That’s where this awesome infographic I found on Twitter comes in handy. 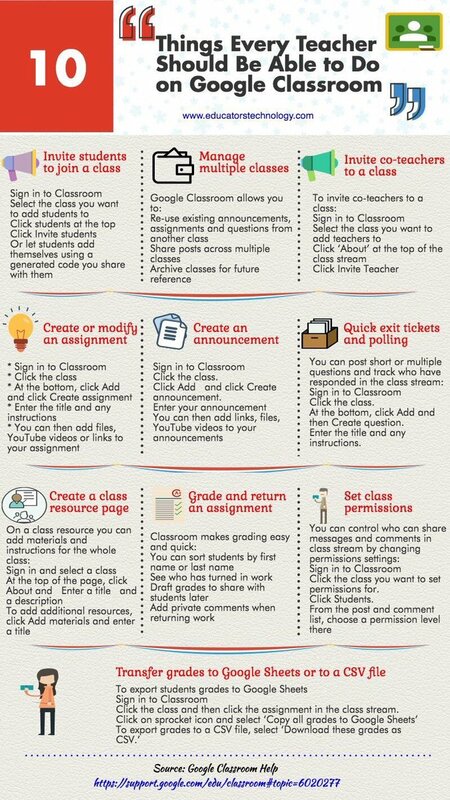 Alex Corbitt posted an infographic called “10 Things Every Teacher Should Be Able to Do on a Google Classroom.” Craig Kemp and Educators Technology created the infographic. You can see a full-blown image of the infographic here. The ten action items listed on the infographic revolve around collaborating with and streamlining processes for both teachers and students too. If you’re curious about other ways teachers use Google Classroom, there are tons of resources available. You can either search for the specific tool you’re looking for or browse through tons of Google-related content here. How do you use Google Classroom? What are some ways you’ve seen teachers use Google Classroom in the past? And in the music classrooms? General and performance based???? We have 1:1 iPads at our school, which has made Google Classroom very usable for my band classes. I use it to distribute custom exercises and warm-ups that I create on Sibelius, as well as our class handbook including all concert dates. When we watch video performances in class I have them post reflections on Google Classroom. I’ve also used it with Slides to create flash cards that they can flip through to help them learn terms, symbols, note names, and other things. At the end of classes I will often post a question and ask them to comment before they leave. All of these things are available to students at home, so the kids that miss class don’t completely miss out. And for those of us teaching pre k and kindergarten students? For those teaching Physical Fitness? I am an Instructional Coach and PE teachers use it in a variety of ways. Weight lifting classes use tablets to video techniques and then critique and offfer feedback. They also track their fitness progress through Google sheets Teachers integrate writing through Google Classroom prompts for each unit, and any assessments are easily done through Google forms. Yes! Teachers love Google! 🙂 Thanks for shearing! I teach k-4 elementary computers. I use Google classroom with my third and fourth graders. The best thing about Google Classroom is a new feature they recently released that allows you to select which studens to receive assignments! This is an amazing feature as I am not able differentiate my lessons allowing my students more individualized lessons tailored to their needs.